As the cable car glides up the mountain in Japan's Yamagata prefecture, the snow-covered fir trees below begin to transform, taking on a bulkier appearance as their green coats disappear under a mass of white. Soon they become unrecognizable, completely engulfed in fluffy piles of snow. The volume in the car increases a few decibels. Passengers excitedly raise their voices, snowboards and skis scraping across the floor as riders shuffle to move into better viewing positions to take in the incredible landscape below. It's a common reaction among those first encountering the legendary "snow monsters" of Zao Onsen -- or "juhyo" in Japanese. The excitement intensifies when passengers exit the tram and set out to explore the mysterious figures up close -- some on foot, others clutching their riding gear, ready to glide through the monsters as they make their way down the mountain. The juhyo phenomenon is the result of some pretty harsh weather systems. As notoriously heavy winter storms rush though the Zao Mountain Range, blown in by a Siberian jet stream, trees on the upper sections of some peaks begin to collect thick, juicy layers of snow and ice. The trees are eventually frozen into the fascinating forms that have turned this small village into a popular winter destination. Much like staring into the clouds, part of the fun of exploring Zao's snow monsters includes playing the old "what do you see" game -- a snowy version of the Rorschach test. The covered trees stand defiantly, bearing poses resembling everything from a cougar frozen mid-roar to a white witch pointing her long bony finger into the blue sky on the horizon. Many are grotesquely beautiful, deserving of a role in a Tim Burton film. 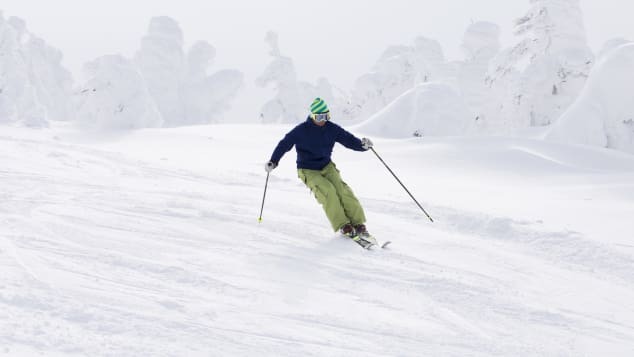 Though the area is popular with Asia-based tourists, Western ski enthusiasts have traditionally been few in number. That's slowly changing says Lyndell Keating, co-director of Powderhounds.com, an online powder skiing guide that also offers ski and snowboarding tours around the world, including in Japan. "Zao is definitely increasing in its popularity with foreigners," says Keating. "Seven years ago, we didn't see any other gaijin [foreigners] and no one in the restaurants or our hotel spoke English. Whilst it's not as high-profile as many other Japanese ski resorts for foreigners -- e.g. Niseko, Hakuba, Nozawa Onsen, Myoko Kogen -- there are certainly more visiting now and English is more widely spoken." Indeed, Zao Onsen might not be the first choice for those in search of fresh powder and world-class ski runs. 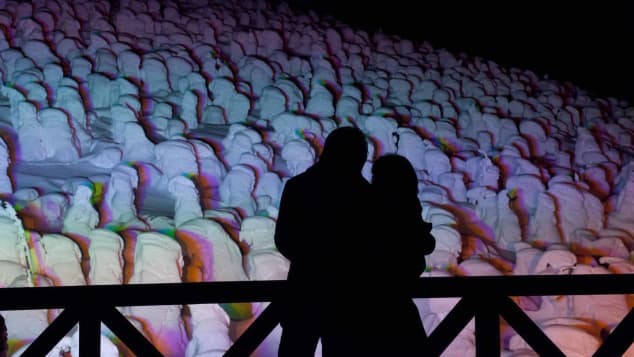 At night, the Zao Snow Monsters are illuminated. 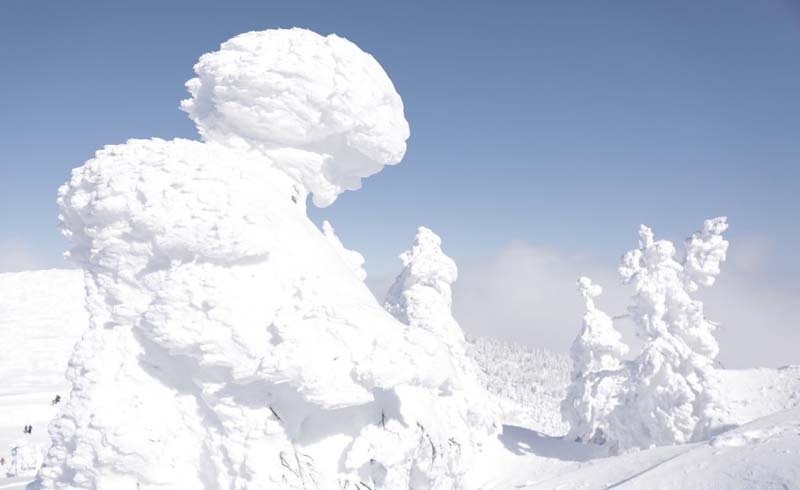 But it offers one of the easiest ways to experience the snow monsters, which are found in other parts of Japan though often require substantial efforts to access. "If you haven't seen them before they can look pretty impressive and rather dramatic," says Keating. "What sets Zao apart from other areas is that there are so many snow monsters in peak season, that non-skiers can readily view them, that they host evening illuminated sessions, and that there is a piste run through the middle of them." To reach the snow monsters, visitors take two connected, enclosed cable cars, the first of which starts from the main Zao Ski Resort ropeway base. For skiers and snowboarders, access to the cable cars is included in the Zao Snow Resort lift package. For those on foot, there's a separate round-trip ticket. Once at the top, visitors on foot can head out of the observation area to a roped-off section and roam freely among the snow monsters. Those planning to ski down the mountain head left to a separate trail that connects with Zao Ski Resort's other runs. There are washrooms and a cafeteria-style restaurant in the observation center. Skiing through snow monsters at Zao Onsen. Zao Ski Resort, which is spread over several peaks, is a mid-sized facility that's ideal for beginner and intermediate riders. Its longest downhill course is a 10-kilometer stretch that starts up at the snow monster observation area. It has 42 lifts -- three ropeways, one cable car and 37 chair lifts -- though the layout "is not particularly ideal and some poling or skating may be required in places," says Powderhounds in its review of the resort. Overall, however, it's an excellent destination for anyone looking for a great day of riding in beautiful scenery. The trail leading away from the snow monsters is not for newbies, which means visitors wanting to ski amongst them should evaluate their own abilities first. "What's most scary about the snow monsters is that lots of ski tourists like to head down this trail, even if they are only beginners (it's an intermediate rated trail). You have to keep your wits about you," says Keating. And of course, bear in mind there's a reason the trees look like this -- the weather can get ugly. So if possible, plan your trip around the forecast. Some slopes are open for night skiing, excluding the trail leading from the snow monsters. Lessons are available, though those requiring an English instructor are advised to reserve ahead. Rental gear can be found at the ski resort as well as various Zao Onsen shops and some of the bigger hotels. This includes snowboards, skis, jackets and pants. Some shops offer helmet and goggle rentals as well, though helmets are not mandatory on the slopes. Gear quality and price varies. Zao Onsen itself is a small, walkable mountain village with huge charms, offering a classic small-town Japan experience. This being an onsen (hot spring) town, the smell of sulfur is rich in the air -- a scent that can please or repel depending on individual tastes. In addition to several public onsens, some hotels have their own in-house hot spring facilities. Accommodation options range from small inns to a few bigger resorts like Zao Shiki no Hotel, where guests can choose between traditional Japanese or Western-style rooms. Breakfast and dinner is included as part of the room rate at some accommodations. If you're lucky you'll receive a serving of the phenomenal Yonezawa beef, which is raised in the same prefecture. In the village, there are several quality restaurants serving the usual Japanese fare as well as classic izakaya-style bars. Need a break from Japanese food? The adorable Craftbeer&Pizza Quantum serves up delicious pizza, has a great selection of beer and plays snowboarding videos. But if it's nightlife you're after, you'll be partying on your own. This is not a party town and the streets are fairly dead when the sun goes down. Regardless, it's worth taking a nighttime stroll. After dark Zao Onsen adopts its own spooky vibe, with steam from the onsen waters rising in big white poofs out of the drains and streams that trickle through the town's hilly slopes. In some areas, colorful lights illuminate the steam. Zao Onsen is worthy of a three-night stay, which will allow you ample time to fit in a bit of riding, hot spring soaking and snow monster exploring. If possible, go during the week -- we had the mountain to ourselves and lift lines were non-existent. Weekends are another story. The best time to see the monsters is late January to early March, before the spring warmth seeps in. From January 27 to March 4 the cable cars run from 8:30 a.m. until 9 p.m for those wanting to see the snow monsters illuminated at night. The easiest way to get to Zao Onsen is by train and bus. Bullet trains run direct from Tokyo to Yamagata Station throughout the day. The ride takes just over 2.5 hours. Some resorts offer pickups direct from Yamagata Station, which is about 16 kilometers away. Otherwise, buses depart every hour for Zao Onsen and the journey takes about 40 minutes. At Yamagata Station, follow the signs to the main exit and take a left to the bus station, which is part of the same building. Every winter, as Siberian winds rush though the Zao Mountain Range, trees begin to collect thick, juicy layers of snow and ice. 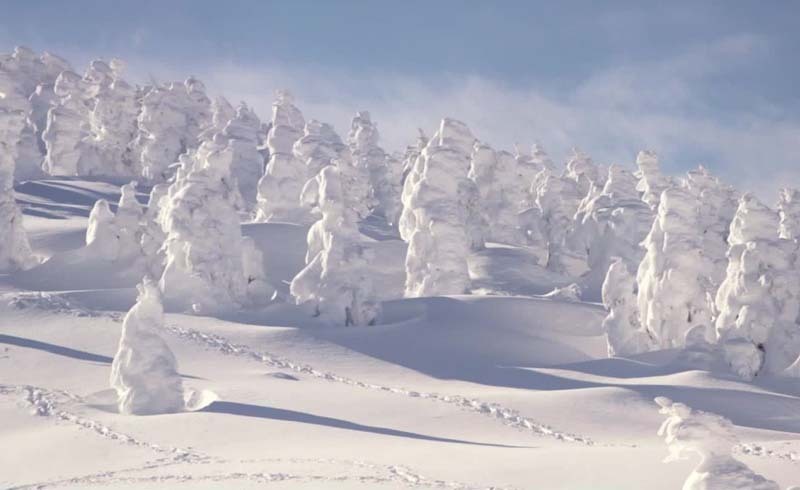 The trees freeze into these fascinating forms, which have been dubbed "snow monsters."